A highly-regarded junior, it was as an 18-year-old that Bogut announced himself to the basketball universe, leading the Australian team to the gold medal at the 2003 FIBA Junior Mens World Championship on his way to tournament MVP. Bogut took his talents to collegiate America, joining the University of Utah where he was an immediate hit, winning the Mountain West Conference (MWC) Freshman of the Year. This form carried Bogut into the Australian Boomers squad, securing a spot for the 2004 Athens Olympic Games. The Olympic experience proved a catalyst for 213cm centre to return to Utah and establish himself as the hottest prospect in college basketball. Bogut had a season to remember as a sophomore – winning no less nine player of the year allocades – including the coveted Wooden and Naismith Awards as Utah made the Sweet 16 of the NCAA Tournament. It was no surprise when the Milwaukee Bucks selected Bogut with the 1st overall pick in the 2005 NBA Draft, with the kid from Endeavour Hills in Melbourne becoming the first Australian to be drafted at the top spot. A strong debut season that included All-Rookie First Team honours provided the perfect platform for the 2006 FIBA World Championships, where Bogut averaged more than 12 points and 6 rebounds per game. Returning to the NBA, Bogut continue to develop into one of the most complete centres in the league, setting career-highs in points, rebounds and blocks ahead of the 2008 Beijing Olympic Games. After helping the Boomers to the quarter finals in Beijing, it was a tough season for Bogut as injury saw him miss more than half the season, but he bounced back to produce the best form of his NBA career. Through the 2009/10 and 2010/11 seasons, Bogut averaged over 15 points, 10 rebounds and 2.5 blocks on his way to ALL-NBA Third Honours (2010), progressing to be one of the elite big men in the NBA. Injury saw Bogut miss the 2010 FIBA World Championship and 2012 London Olympic Games, with a trade to the Golden State Warriors presenting a new challenge. Despite an injury-interrupted first full season with the Warriors, Bogut played a key role in securing the team’s second play-off appearance in the past 20 years. As a part of the 2015 NBA championship winning Golden State Warriors, Bogut averaged over 8 rebounds and 1.5 blocks a game; acting as the defensive anchor for the Warriors and landing him a spot in the NBA All Defensive Second Team for the 2014/15 season. In the 2015/16 NBA season, the Warriors enjoyed a golden run to the playoffs before a knee injury in the Finals suffered by Bogut served to derail their season as they finished Runners-Up. Prior to being named in the Olympic team despite that injury, Bogut was traded in the NBA to the Dallas Mavericks. Despite his knee injury, Bogut was still a defensive force during the 2016 Olympic Games. 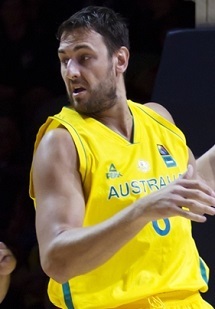 Averaging 5 rebounds, 3.6 assists, 9 points and a block a game, Bogut's NBA experience saw him overcome the odds and become a defensive anchor throughout the international event. Following the Olympics, Bogut returned to the NBA to suit up for the Dallas Mavericks in the 2016-17 NBA season. Bogut played 26 games for the Mavericks pulling down 8.3 rebounds per game. After being traded & subsequently waived by the Philadelphia 76ers, Bogut signed with the Cleveland Cavaliers to boost the Cavs for the 2017 playoffs. Unfortunately in Bogut's first game with the Cavs, he fractured his tibia ending his season. Bogut then signed with the Los Angeles Lakers for the 2017-18 season, where he played 24 games before finally being waived in January 2018. In April 2018, Bogut announced he would be signing a two-year deal with the Sydney Kings in time for the upcoming 2018-19 season. Bogut enjoyed a fantastic first season in the NBL, averaging a double-double of 11.6 points and 11.7 rebounds to go along with 3.5 assists and 2.7 blocks per game. Bogut's play helped lead the Kings to the NBL finals as the big man took home the NBL MVP award and the NBL Defensive Player of the Year award. After the Kings lost in two games to Melbourne United in the Semi-Finals, it was announced just days later that Bogut would be re-joining the Golden State Warriors for the remainder of the 2018/19 NBA season.